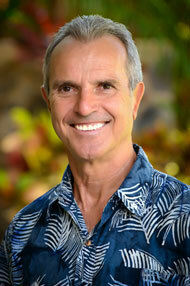 Barry Brown is the Principal Broker and co-owner of RE/MAX Island Properties on Maui. Barry has strong real estate sales, development, and brokerage background with extensive experience in appraising, management, negotiating, government interaction, and community service. He has owned and operated three successful real estate companies in Alaska and Hawaii and managed over 100 properties since 1975. Developed numerous real estate projects in Hawaii and Alaska. Active in all phases of real estate, both commercial and residential, and has held an active Real Estate Broker’s license in Hawaii since 1987. William “Buz” Moffett, known statewide as the Surfing Realtor, has been the Principal Broker and Owner of Moffett Properties in Maui, Hawaii since 1992. Has been involved in transactions on all main islands in the Hawaiian chain, and consistently been in the Top 25 realtors for Maui County. Launched a marketing campaign on Molokai in 1998 – 1999 that resulted in the sale of over 100 lots in the Papohaku Ranchlands subdivision.